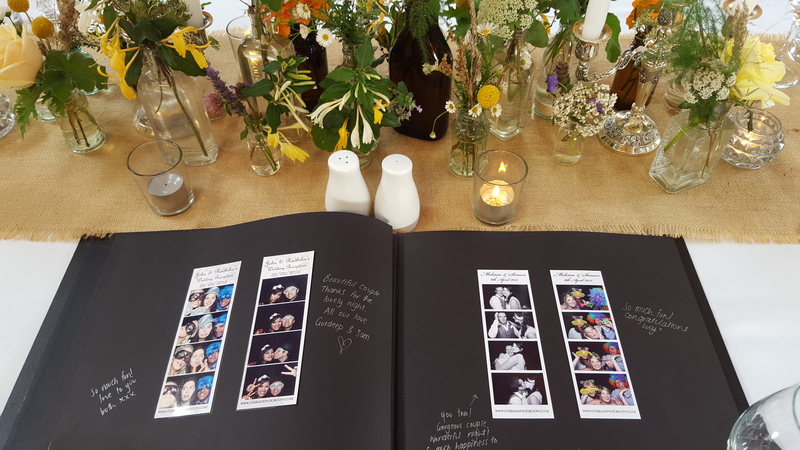 Make your wedding one to remember with Little Black Photo Booth. Hours of fun and instant, long-lasting memories to keep and share with your wedding guests. Every photo strip prints as many times as you need – 10 faces in the shot? 10 prints! Our professional, courteous booth operator will be on hand to encourage and assist all your guests to make the most of your Little Black Photo Booth experience. Your booth will come with a wide selection of zany props to add as much colour and hilarity to your strips as possible. 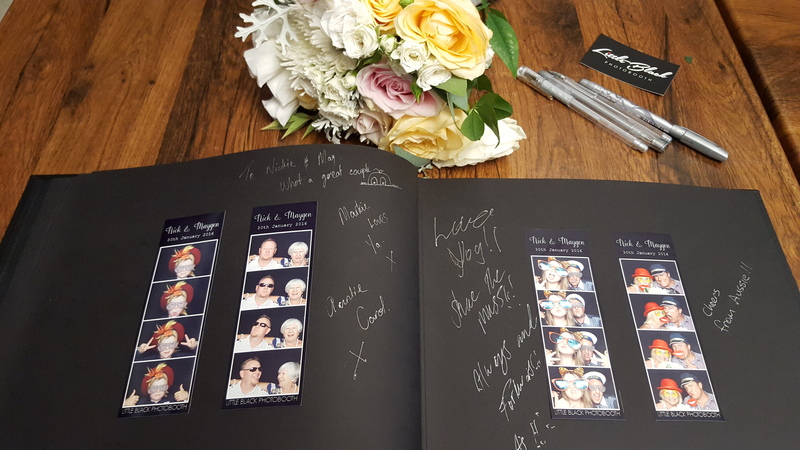 You receive all of the photos taken on the night, both print out strips, and the individual photos, the next day via an online link that you can share with all your guests. The photos are downloadable and high quality. 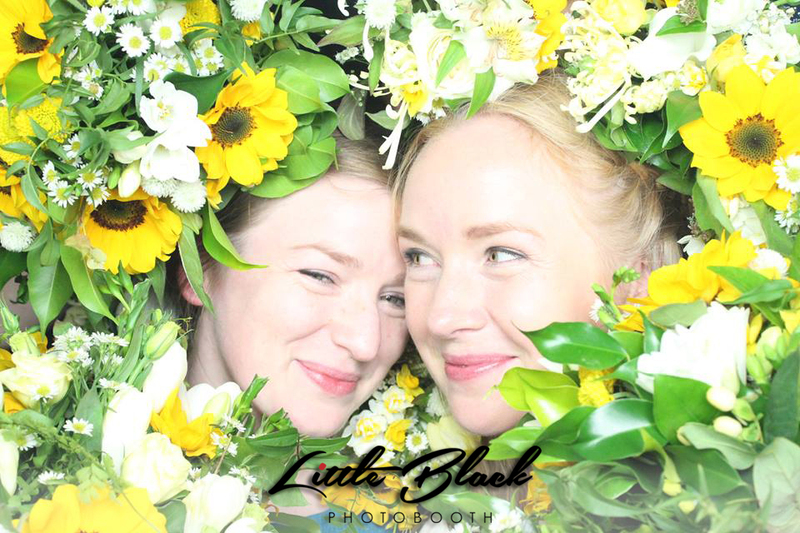 Bridesmaids making use of their bouquets in a Little Black Photo Booth at a wedding! We get asked a lot; “I’ve already hired a photographer, why do I need a photo booth, too?” and at Little Black Photo Booth we believe photographers and a photo booth are two completely different things. The photographer captures your wedding, your ceremony, the cake, first dance, all the bridesmaids and groomsman… but what they don’t capture is all the guests at your wedding and all the fun everyone has together. People really come out of their shell behind closed curtains and that’s what we capture: All the love, laughter and fun your family and friends all have together. Add one of our amazing hand-bound, hand-made photo albums to hold all of your photo strips from your big day! You can have any words, font, colours and decals on your photo strip you want! Supply us with your invitations and we will match the photo strip to them. As well as being able to take as many photos as your heart desires we also will print as many copies of each photo as you want. This means that if there’s 10 people in a photo you each get a copy! You get a next-day online link to both all the individual photos and photo strips taken so you’ll have them till the end of time.